Thanks to MyBlogSpark, I recently had the opportunity to try Pillsbury® Grands!® Frozen Mini Biscuits, the new, tiny freezer-to-oven biscuits from your grocer's freezer case. Now I love my own homemade biscuits, and I'll be honest. I had never tried these. Lawdy mercy, they are good! Fantastic piping hot and straight out of the oven, I loved these. I mean look y'all, seriously. A perfect size for kids, there are countless ways to introduce these to meal time, from miniature ham sandwiches for the kids come lunchtime, to delicious sliders for football or evening entertaining to mini desserts. There are so many ways to make these biscuits and your family will love trying each one, and... with a little built-in portion control (that is if you can manage to resist them!) they can satisfy that biscuit craving at only 70 calories a piece, to help keep you on track with your calorie count. Soooo, piping hot biscuits aside, I wanted to try and incorporate these mini treasures into a recipe, and remember that chicken stew that I made recently? 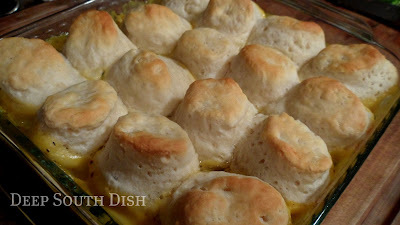 This my friends, was where that stew was intended to land - topped off with some of these little, mini biscuits for a super easy biscuit topped chicken pot pie! I love getting multiple meals out of one meal anyway, so how about that - a 3 in 1 meal? Even better. First, I started with my Garlic Roasted Chicken for meal one. Got a big family? Roast two chickens at one time and once it's cooled down enough, pull the meat off and place it into freezer bags. Love that! You'll easily have leftovers to make super quick weekday meals like I did with my Easy Chicken Stew for meal two. And last, the leftovers from that stew were turned into a casserole with this Biscuit Topped Chicken Pot Pie for meal three. Love that too! Now this chicken pie makes a great casserole in a 9 x 9 baking dish, but I thought for those of you out there with little sous chefs running around, the idea of using little mini ramekins to make individual pies might be an appealing treat. Kids love having their own little individual dishes, and these little mini biscuits made a perfect topper for that! Let's make some! The stew is a super simple dump and heat dish and very tasty, so even if you have to make it just for this chicken pie, no problem. Spoon the hot stew into a buttered baking dish or individual ramekins. Sprinkle some cooked, crumbled bacon on top of that. I did let the biscuits thaw slightly so that I could cut them into pieces. Cut biscuits into halves or quarters, depending on the size of your ramekins. The ones pictured are the 7 ounce size, so I used two biscuits halved for each ramekin. For a larger 10 ounce ramekin, you'll probably need three biscuits. Add the biscuit pieces to the top of the ramekins and brush with melted butter. Bake at 350 degrees for about 20 minutes or until stew is bubbly and biscuits are golden brown and cooked through. How easy is that? Be sure to let the ramekins cool down before letting little munchkins handle them! Or ... go this route instead and simply transfer the hot stew into a buttered 9 x 9 inch casserole baking dish, and top it with whole biscuits instead. Bake. Easy. Congratulations to Mari - you're the winner of the Pillsbury Mini Biscuit giveaway!! I've sent you an email, but you must respond to it within 48 hours or an alternate winner will be selected. Congratulations and thanks for participating and for reading Deep South Dish!! How about a chance to try some of this little mini bites of fluff yourself? For free? 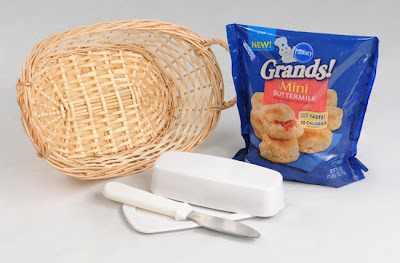 Pillsbury and MyBlogSpark are offering one of my readers a VIP coupon for 1 free bag of Pillsbury® Grands!® Frozen Mini Biscuits, PLUS this Biscuit Basket, PLUS a Butter Spreader, PLUS an acrylic Butter Dish, FREE! They are also gonna throw in a $15 GIFT CARD to go towards your expenses to come up with a recipe creation using these mini biscuits!! Get out! Simply leave a comment here and tell me how you will use that $15 to incorporate Pillsbury® Grands!® Frozen Mini Biscuits into your mealtime plan. What recipe might you make? It's okay to enter anonymously, but please leave your first name and a way to contact you if you win! Earn one bonus entry by sharing this post! Post about it to your Facebook page, Stumble it, blog about it, post on a cooking related bulletin board you frequent, or tweet about it from your Twitter account. You can post one bonus entry, one time each day - just be sure to come back here and leave a separate comment for each daily entry. ➮Giveaway closes on November 11, 2010 at 12:00 noon CST. ➮You may send me an email if you don't want to post your email address publicly. Please put "Pillsbury Biscuit Giveaway" in the Subject line. ➮The winner will be announced in this post and notified by email and will have 48 hours from the time of that email to reply and claim their win before an alternate winner will be selected. Don't forget you can join Deep South Dish on Facebook to keep up with recipe posts and giveaways like this! To keep up with Pillsbury product updates, recipes, contests, coupons and more, follow them on Facebook too! 118 HUNGRY PEOPLE COMMENTED. ADD YOURS! 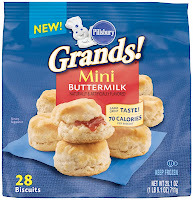 I love Pillsbury Grand Biscuits and love..love..love..that they came out with these minis! I make a mean fried chicken and gravy, so what I think I'd do is fry up some chicken pieces that would fit on these mini's, stir up some creamy chicken gravy and make me some Fried Chicken and Gravy sliders. I think I would work on beef stew with biscuits on top. Like a beef stew pot pie. Oh how cute! I've not seen these in our stores yet, but would definitely get them for the upcoming holidays...I would fry up some country ham and server slivers of that in between each little pillowy biscuit. I really like your idea too of the chicken pot pies!! What a great giveaway! I'm a huge fan of ALL Pillsbury products. I would definitely use these with Biscuits and Gravy- Yum! I make a mean browned sausage gravy that my pals all love served over biscuits. These would be perfect. I haven't noticed them in the stores around here in VA. There's some great sounding recipe ideas here, but I'm going old school--butter and homemade jam with afternoon tea. 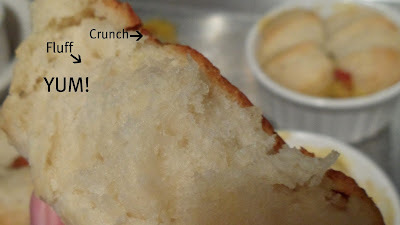 There is nothing better than a good biscuit all drippy with melted butter. Pillsbury Grand Biscuits is our favorite and the only ones my son eats. I love Chicken stew and would try your recipe with these. I'd like to make them into mini strawberry shortcakes. My kids love biscuits and gravy for dinner!Or bacon, egg and cheese biscuits...OOOO, open faced with scrambled eggs on top and smothered in cream gravy! Can you really go wrong? Very cute! We use the refrigerated biscuits to make donuts when we're camping. These mini biscuits are super cute. Love Pillsbury biscuits; I hadn't seen the minis. 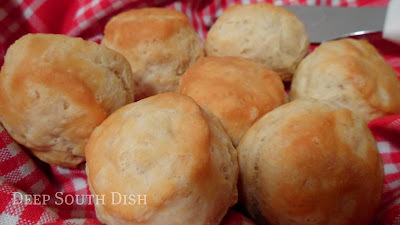 I would combine leftover chicken and gravy to make chicken shortcakes with these biscuits! My favorite way to eat biscuits is with strawberry sauce and real whipped cream, so that's what I would try! Love your recipe though, it looks mighty tasty!! Well, this may not technically be a "recipe" but they would be used for biscuits and gravy! Yum-O! I'd like to use it as stew toppings. I think I would serve these with sausage gravy. My husband loves the Pillsbury Grand Biscuits and I'm sure he would love these too! I use these a lot when I have to make a large batch of Chicken and Dumplings for a crowd. I also bake some off along with rolls and scratch made southern style biscuits as different people like different textures of bread. I'd probably use it for a mini snack, probably halved and put in a mini cup cake pan, filled with alfredo sauce and mushrooms, topped with shredded cheese and baked. These look GREAT! The perfect size for a quick and easy breakfast! I haven't seen them in our stores yet but I'll be sure to try them! I think I would like to make a fall dish of seasoned pork loin with pumpkin, turnip roots, butternut squash, apples and apricots, when done I'd like to roll my biscuits in a little butter and some herbs and bake them on top. Serve all with a little maple glaze. Sweet and Savory! I use any leftover Pillsbury Grand Biscuits split em like english muffins for appetizers, egg and cheese biscuits. I am so putting bacon in my next pot pie! Haven't seen these yet, but we use the Pillsbury Southern Style biscuits all the time. I can see mini hot roast beef sandwiches topped with gravy around a large dollop of mashed potatoes! Honestly, I would just eat these with Ham & cheese & eggs. I'd use them to make a chicken pot pie. OMG..as much as I would want to eat 20 of these with just a piece of country ham and preserves I think I would love to make a dessert out of them. Maybe an upside down apple cobbler. Top the apple filling with a pecan praline topping then biscuits rolled in butter and cinnamon sugar...yum! Perfect finger food for Christmas Eve. I'd put ham and cheese inside, herb butter outside and heat them until the cheese melted. These biscuits look delish! We have a local shop that sell honey grown locally that is wonderful! They bottle regular, whipped, and whipped with cinnamon or lemon added. It would be terrific on these little biscuits with a pat of butter!! I use the regualar size frozen ones all the time. I think I would make mini empanadas out of them. Sooo many uses....soooooo many uses! How can I pick just one? I'm sure they would be to die for filled my my old fashioned wild blackberry jam or wrapped around a hunk of country ham. I really can't see a biscuit without seeing delicious gravy smothering it. So hungry!! That looks way better than any chicken pot pie I've ever seen! I'm not very good at inventing my own recipes, but it might be some sort of biscuit topped chili type thing. I would pick up the items to make Chicken&Dumplings. I love Pillsbury frozen biscuites. I will probably use these little minis for little ham biscuits for upcoming Christmas parties. Thanks for the chance to win. 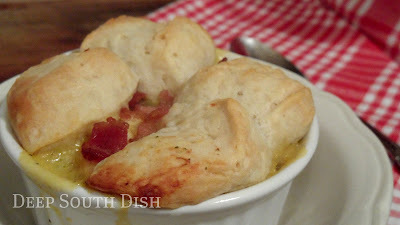 Your mini chicken pot pies look so yummy-wish i could have one right now!!! Wow what would I do with these little babies?? Sliders for sure, my hubbys favorite biscuits and gravy! I love my own homemade biscuits but I have to admit that while I have not tried the mini biscuits I have tried the regular size frozen Grand's and they sure are good. I can think of all kinds of good ways to use these...chicken pot pies, chicken and biscuits and am wondering how they would be on top of a cobbler. I would love to make some chili topped with these biscuits. Alas I have no ramekins so need to buy these neat little bowls. well i am a leader of a girl scout troop :) for thanksgiving we are doing stone soup for our parents and these mini biscuits are perrrfect to compliment the soup and im pretty sure they'd be awesome with your chicken and rice bake which i really seriously cannot wait to make tomorrow night! I'd have them hot out of the oven with butter and a good squirt of honey or a heaping spoon of blackberry jam or cherry preserves. I consider this a dessert! I'd bake them on top of chicken stew. Thanks for a great chance at a giveaway! I have heard of these, but haven't tasted them yet. I would pull them apart, put a piece of whole chili pepper inside and a piece of mild cheddar, smash it together and bake it. I know it would be something awesome to eat. I would use the money to purchase all of the things to make this dish. Mary, Mary, Mary ... what would I use these for ... hmmm just what meal of yours am I cooking? LOL. No seriously, I would LOVE them with a hearty stew. Now doesn't that sound just yummy? I definitely want to try them with sausage and country gravy. Then I need to try one of the other suggestions on your site, they all look so good! I would use them for my cherry dumplings,so good. Would love to try these. I don't wantcha to think I'm just stopping by to win your giveaway. I just happened to finally have a moment to catch up and here I find you're having a wonderful giveaway. We're big biscuit fans around here...we do biscuits and gravy a couple of times a month (at least) and I always serve em' with my beef stew. I bet my kiddos would especially love these lil' ones. What a great idea to use them for chicken pot pies. I'm off to check out your chicken stew recipe now! Hope all is well down South! I would like to try them atop a hamburger/cheesy casserole. YUM! Looks wonderful, Mary! You know I love the dump meals! Pillsbury makes some nice biscuits. Love the grands! I'd make a turkey and veggie casserole dotted with mini biscuits, yum! I would use these for a Sunday morning breakfast with either smoked sausage or ham. Yummy!! These look delicious! I would use them for my famous egg, cheese and porkroll on a piping hot biscuit! Yummy! I would make hot ham and swiss cheese mini-sandwiches. MMMMMmmmmm! Ohhh I love these tiny biscuits! I have so many recipes to use these with that I can't wait to start cooking! I definitely will be using them with the beef sliders instead of dinner rolls, with sausage gravy for breakfast, & the mini ham/cheese sandwiches I always make for appetizers! So many ideas! My family is going to love these!!!! I love those biscuits! If I had $15, I would make shepherds pie and top it off with a biscuit crust! YUM!!! Crumble and cook sausage in large skillet over medium heat until browned. Stir in flour until dissolved. Gradually stir in milk. Cook gravy until it thickens. Season with salt and pepper. Serve hot over biscuits. Great for biscuits and gravy, strawberry shortcake, or some of my brother's famous Coke ham. I'd definitely like to try them with the chicken stew! Yum, I would use the Pillsbury Grands for Chicken n' Dumplins! I am anxious to try Mini-Grands, because the Grands biscuits are really yummy and the frozen ones are just so convenient! That old Southern favorite...country ham and a little red eye gravy, over those scrumptious mini biscuits! I can be reached at huntersvillewriter(at)gmail(dot)com. OOOhh I love this idea!... I bet I could roll these out and make a batch of mini tarts... Hmmm pumpkin? or cheesecake? the possibilities are endless!! We love breakfast for supper. I would use them with tomato gravy and chocolate gravy. Rich warm chocolate gravy poured over a hot fresh biscuit = yumminess! Ooops. Trish D. can be contacted at Dwaterfam4@bellsouth.net and I posted to my facebook. I would use these as a side for some fried chicken. We love biscuits with honey. I would also do a breakfast for supper with eggs, bacon, hashbrowns and biscuits with jelly! I like to use mini grands in chicken and dumplins... yum yum... I have also used them with chicken pie, and chicken roll ups, very good... You have a great product and the mini's are perfect for little hands..
My kids and grand-kids love chocolate gravy and biscuit. These mini biscuits would be perfect for them. Chicken pot pie, chicken and dumplings, biscuits and gravy, hmmmm.... just have to decide which one to try first. Hope I can find them around here! So many great possibilities..chicken or beef pot pies, or maybe a peach cobbler using the biscuit on top..yum!! I didn't know about the minis! I want to make individual chicken pot pies, and these would be perfect for the top! You did great with your recipe ideas on these, Mary. I'm not entering the giveaway but I know we'll be picking up a bag of these for weekday breakfasts. I can think of all kinds of sliders and such. We'd use them for brunch for mini biscuits and gravy :) Perfect to get a taste, but still have room to sample other things, too! I've never seen the mini grand biscuits - so cute! I love Grand Biscuits - my boys, do too. I think I'd actually use the gift card to get the things needed to make your chicken pie - that looks delicious!!! Grands are a great way to go when you don't have time to make your own biscuits! I love the recipe idea you came up with too!! Tweeted this too at peanutsmom04! Yum! I'd love to do some mini sausage & biscuits with them. I will put these biscuits in my beef stew. Mary I tweeted today ... aren't ya proud of me. I should get a sticker, lol. Comments are closed - watch this space for the winner announcement soon!! Thanks for participating and thanks for reading Deep South Dish! !